This month we have a new food truck! 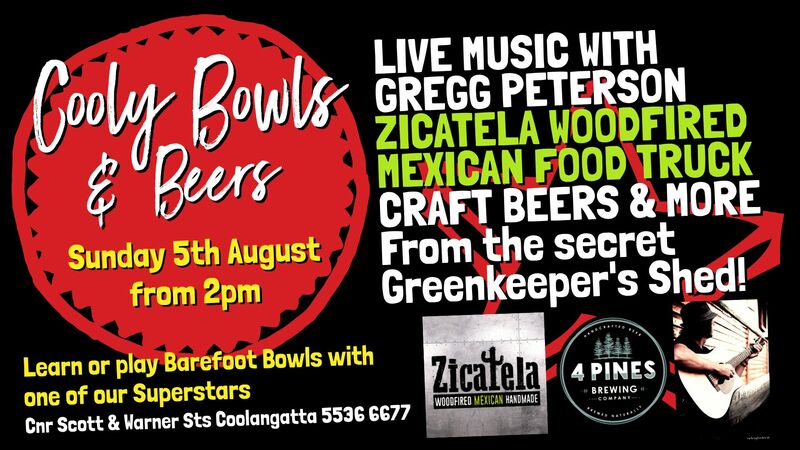 We welcome Zicatela – Woodfired Mexican on board and we are extremely happy to present live music with Gregg Peterson on Sunday 5th August from 2pm. Gregg is an American musician now calling the southern Gold Coast his home. Growing up in the greater Chicago area his musical roots stem from 60’s and 70’s Rock, blues, jazz, bluegrass and a little country. Heavily inspired by the road warrior bands of The Greatful Dead, Phish, Allman Brothers and Widespread Panic. Gregg spent his teenage years following these bands around the country amazed by improvisational jams and interwoven play. Gregg then furthered his musical tutelage at Music Tech of Minneapolis where he was instructed by Nashville’s own and jazz great Mike Elliot. After music school Gregg honed his skills playing solo and in bands around Phoenix, Az before moving to Australian shores. Gregg’s solo performances seem anything but solo with the use of loopers and foot stomp he creates rich layers of sound that allow for his expressive lead guitar work. You will hear an impressive mix of musical styles in his originals and covers. We kept the key to the secret Greenkeeper’s Shed which has been restocked with more great craft beers from the 4 Pines Brewing Company, Brookvale Union Ginger Beer, Coronas, Ciders & More. Our very popular Superstars will be on hand to show you a thing or two about Barefoot Bowls or just chill out and listen to great music.